This beautiful oyster plate features 6 wells for oysters. It is marked at the back. Nice addition to your table or just to display. Very rare and beautiful gold-plated chandelier. Italy, 1970s. The Chandelier requires five European E14 candelabra bulbs, each up to 40 watts. Antique French CFH Haviland Limoges hand-painted porcelain oyster plate, circa 1880-1890. Antique French Haviland Limoges hand-painted porcelain oyster plate, circa 1890. 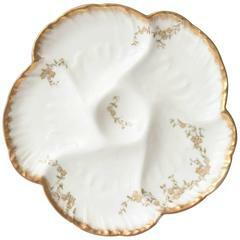 A Classic and elegant oyster plate for your collection. Gilded shaped edge with nice centre well and delicate hand-painted design. We have more of these, please inquire. Antique French Oyster Plate, Turkey Pattern, Signed "Haviland Limoges"
Antique French hand-painted porcelain oyster plate in a Turkey pattern signed "Haviland Limoges & Co.", circa 1890. Antique French hand-painted oyster plate signed "Haviland Limoges Co.", circa 1890s.